All 5 of our software products at a discount price! Convert protected or unprotected audio and video, download online video and TV, listen to and record internet radio, download free MP3s, copy / backup / burn DVDs and more! SoundTaxi Discount Bundle Pack is a complete solution that contains all 5 of our cool software products at a discount price! 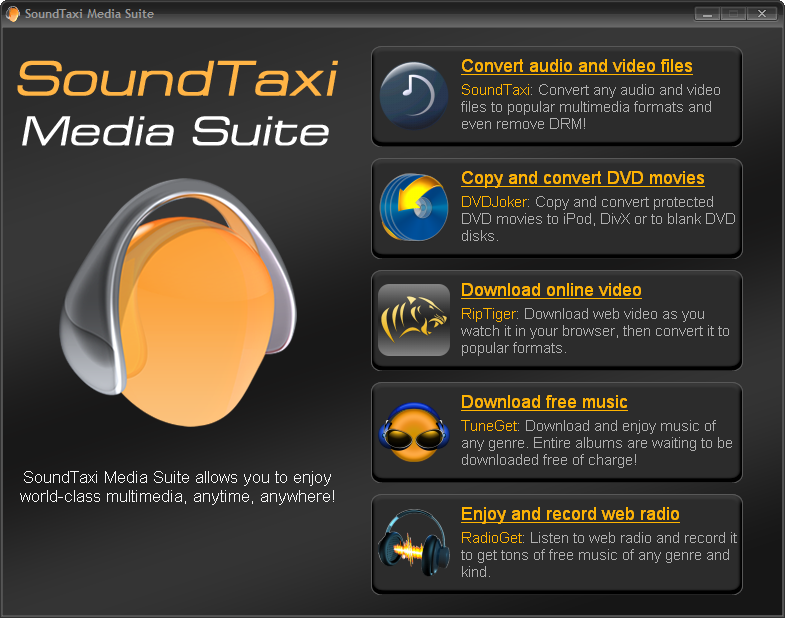 This Media software Pack includes the complete editions of SoundTaxi, RipTiger, TuneGet, GetRadio, and 1Step DVD Copy. Convert protected or unprotected audio and video, download online video and TV, listen to and record internet radio, download free MP3s, copy / backup / burn DVDs and more! SoundTaxi Discount Bundle Pack. - the most powerful all-in-one media solution!